Fischer Measurement Technologies (India) Pvt. Ltd., is an ISO 9001 certified company and 100% subsidiary of Helmut Fischer Holding, Switzerland. Founded in 1953, Helmut-Fischer is an innovative leader in supplying XRF instruments and a complete solutions for precise Gold, Silver and other precious metal Testing. Today FISCHER instruments are used successfully in the field of Hallmarking Centre, Testing Labs, Assaying Centre, Jewellery Manufacturing, Fashion Jewellery and Retail Jewellery Shop various other industries. We are the most experienced leader in this field as it has more than 50 years of competency and knowledge built since its inception in 1953. Moreover Fischer India is the only company in this field having direct operations, thus securing the investment of its customers. When performing coating thickness measurement and material analysis for purposes of quality assurance, incoming goods control or production processes, it is important to have precise gauges that are both portable and safe to operate. For such applications the new FISCHERSCOPE® X-RAY XAN® 500, which employs X-ray fluorescence technology, is an excellent choice. High end measurement system XAN 500 was developed specifically for high precision analysis of Gold, Silver and other precious metals as required in the field of Gold Mining Industry, and testing laboratory. For such applications the new FISCHERSCOPE® X-RAY XAN® 500, which employs X-ray fluorescence technology, is an excellent choice. In its latest X-ray fluorescence gauge, FISCHER unites decades-long experience in precise coating thickness measurement with the current demands of process and quality control. 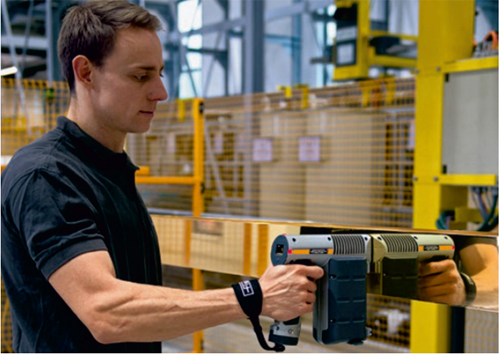 The XAN® 500 enables the safe and accurate measurement of small parts inside a desktop device as well as the external measuring of bulky parts with a mobile handset. In addition, the housing of the table-top system serves as a carrying case, allowing for quick transport to other locations. The desktop device is designed so that smaller samples can be positioned easily and thus reliably measured while guaranteeing protection from radiation for operator and surroundings alike. The mobile handset is simple to remove from the unit for taking measurements on larger objects or in hard-to-reach areas. Its three-point support geometry ensures secure placement on the sample, resulting in repeatable measurement procedures. • Mobile measurements for Large Gold and Silver Components. Knowledge, expertise, experience - based on these principles, FISCHER has been developing innovative measuring technology for coating thickness, materials analysis, microhardness and material testing since 1953. Gauges from FISCHER are now used the world over - wherever accuracy, precision and reliability are required.